I love camping – any chance to go into the woods for a few days and disconnect is OK by me. And yet, the few times I’ve been winter camping, it’s been in a yurt. Not quite glamping (*shudders*), but going up for a weekend and staying in a yurt is the equivalent of renting a really tiny cabin with a separate cabin a 20 minute walk away that has the toilets. Don’t get me wrong, it’s excellent – go up to Algonquin in the winter, stay in a yurt, spend your days playing in the snow, skiing, snowshoeing, building a snow fort, maybe sit in a chair on a frozen lake, extra chilly beer in your mitt-clad hand, watching the sunset. Camp in the winter. Whatever gets you out there, whatever extras you need to take, bundle up for the cold and go. And, when you are given the opportunity to spend a weekend learning wilderness survival skills in the winter… also go. Just… bundle up wayyyy more. 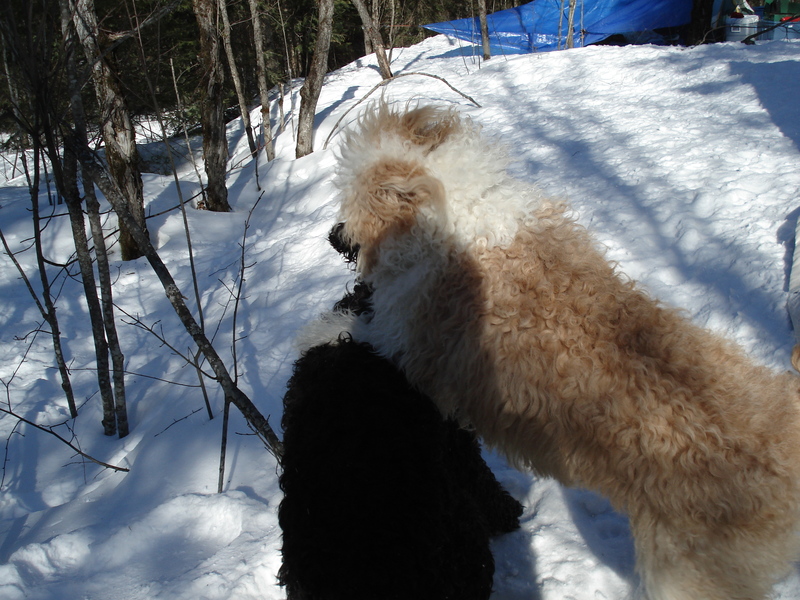 Doodle, Gwynn and I went up near Bracebridge near the beginning of March to participate in an Intro to Winter Camping and wilderness survival clinic organized through the Muttley Crew Meetup Group, a weekend at a private camp where the dogs could be off-leash at all times. 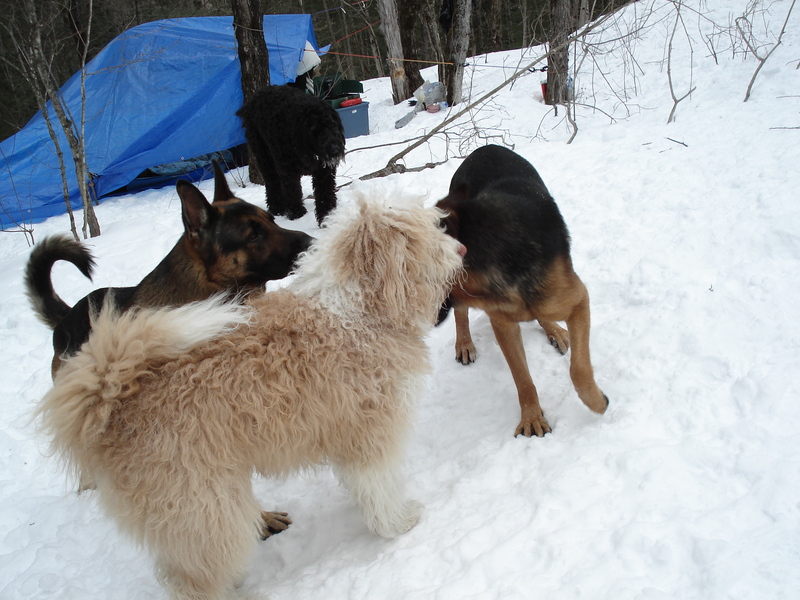 Gwynn and one of the German Shepherds, Sabre, had a bit of a romance all weekend – Sabre would follow Gwynn pretty much anywhere, and I think he’d have followed him into our car at the end of the weekend if he could have. Leaving the balmy +5C temperatures of the city, I was pretty sure I had seriously overpacked on gear for keeping warm. 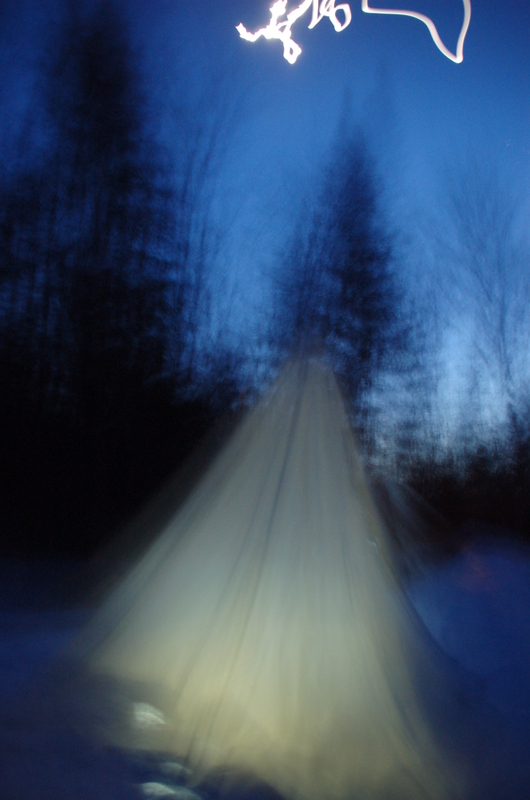 Arriving in the -10C temperatures, in the woods near Bracebridge… I was glad I’d packed so many sleeping bags. By the end of the evening, there were 7 people total, and 7 dogs. Two very large german shepherds, a Bermese, an enormous labradoodle, a Great Dane, Gwynn, and one wee little white dog. Gwynn looked like a small dog compared to all but the little one. We lucked out, in finding ourselves with a group of dogs that all played nicely together. No ganging up or bullying, all the roughhousing was very clearly being enjoyed by all parties, and all in all, the dogs were great. It was like the most ideal version of a dog park visit, ever. 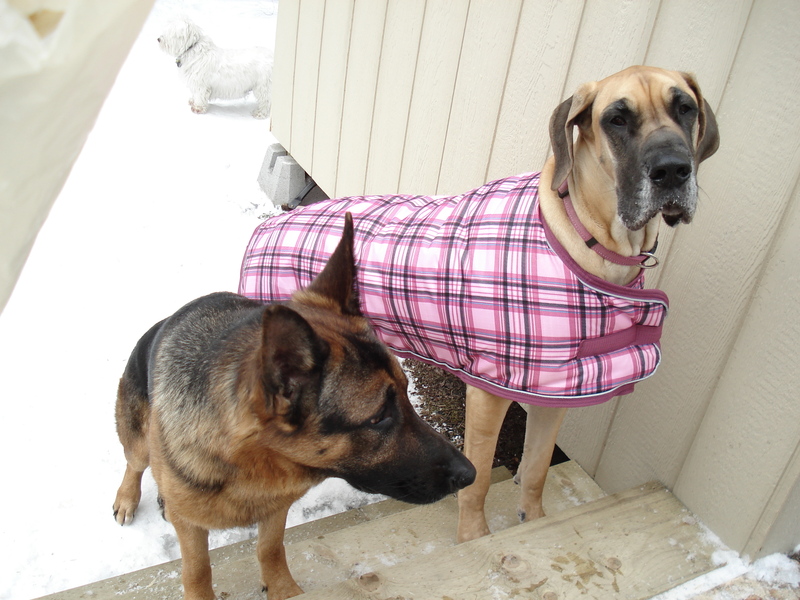 our great dane buddy needed a bit of extra help keeping warm, but she still had a great time out there. On to the winter camping and fun! Before I start with that, though, I want to make something clear – I am not a professional (in anything related to camping, winter, or survival), and I’m not writing a how to winter camp blog post. We packed my regular three-season tent and put a folded tarp underneath the tent. According to one of the leaders from our trip, the winter camping tents are slightly better at releasing the humidity from sleeping, but aren’t really all that necessary for a few days of camping in the winter. We packed three regular three season sleeping bags (not down… and not at all compactable… oldschool Coleman sleeping bags), and the heavy old down sleeping bag my mom kept of her father’s. We layered one coleman bag underneath us (on top of sleeping mats) and two on top, with the heavy down bag on top of all that. Clearly, this method of keeping warm wouldn’t work if we weren’t camping within a five minute walk of our car, but for a drive-up and camp situation, it worked. If I were to go on an interior trip in winter, I’d be buying or renting a good quality four-season bag that would compress down small and light. 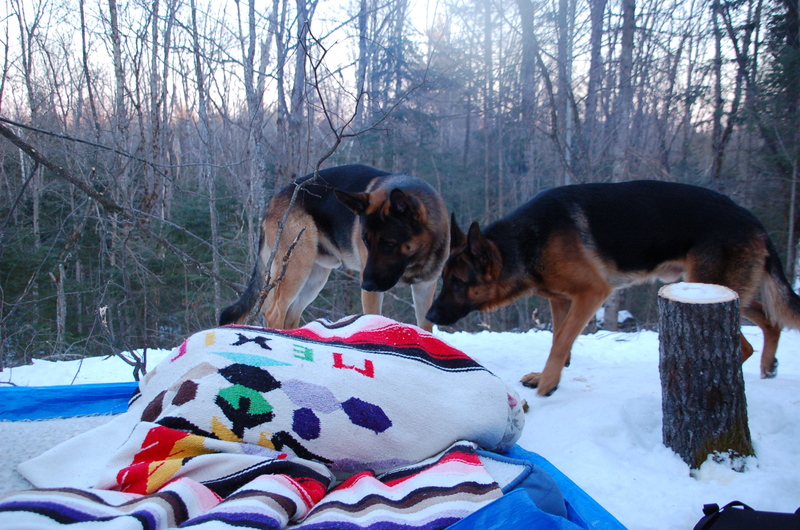 under this blanket was the great dane – the shepherds were shocked EVERY SINGLE TIME the blanket moved, unable to remember that she was under there. We couldn’t get Gwynn under the blankets. I think that’s very much dependent on the individual dog, whether they’re cold or not. Gwynn in March is Gwynn pre-hair-cut, so, frankly, sleeping on our legs, outside of the warmth of sleeping bags, was probably the most comfortable temperature of sleep he’s had since January. The Great Dane would burrow under blankets at night, and had a coat on during the day. Our first night was not pleasant at all. We didn’t bring all our sleeping bags in that night, and Gwynn’s curling up at the foot of our bags successfully pulled off most of the heavy-duty bag, making it hard to stay warm. I find it just about impossible to sleep if my feet are cold. Even with a fresh pair of wool socks (you want to change your socks every day and evening, even if you don’t change anything else – the socks compress down in your boots and absorbe humidity, so they’re less effective by the end of the day), wasn’t warming me up enough to get to sleep. It went down to -16C, and I swear, I woke up every fifteen minutes. Lesson 1: Even if you feel fine now, bring extra warm stuff down to your tent for bed anyways! Next time I winter camp, I think I’ll layer a tarp on top of my tent right from the start, and not feel any qualms about extra extra sleeping bags. One of the other women there gave us the wonderful gift of HotHands hand warmers on Saturday morning, though. They were magical, and made a huge difference on our second night out. It went down to -20C, but we were able to get under the covers and spark some initial heat with hand-warmers between two layers of sock (they say not to have them directly against skin if you’re not paying attention to them), slept soundly and completely restfully through the night. Getting warm at the beginning of the night – even doing some jumping jacks and jogging on the spot before getting into the tent – is a good way of ensuring a warm and restful night sleeping outdoors. If we’d had more nights sleeping there, we might also have had to worry about the condensation buildup in the sleeping bags (damp bag = less warm). Sit tight, and I’ll be back in a few days with tales of the wilderness survival side of our trip! I got Gwynn in the fall, at 6 months. My neighbour, longtime dog owner, asked me if I would be getting Gwynn some boots for the winter. I scoffed. I proudly informed her that I would never dress my dog up in silly and unnecessary people-clothes. He’s a dog. I’m letting his hair grow long to keep him warm in the winter, and mid-October he was already deep into his transformation to wooly mammoth. Wooly mammoths don’t need boots or hats or coats or vests. You know what else wooly mammoths are? 55 lbs of dog whose feet are being burnt and cut by the massive amount of road salt my neighbourhood is coated with in winter. 55lbs of dog is A LOT to carry home, having made it 4 blocks before he refused to budge. And in winter, my hands were unimpressed at their new use as de-icer of dog-paws. I also discovered that the fur between his toes, no matter how I trimmed it, still collected clumps of snow until his toes were splayed painfully and a wad of ice was applying pressure to his palm. Yet another painfully-cold hand-melting of puppy paws on the side of the road. The boots I bought him that first year were useless. Within days of first purchase, the straps were fraying. If I’d left them as they were headed, the boots would have been strapless by the end of the month. Velcro, by the way, does NOT hold up to being covered in snow. Nor does it work to re-velcro once there’s snow in the tines. The leather sole to the boot also started coming unwound within a few uses – yet another sewing project for me. The damn things didn’t stay on at all well, either – they flew off no matter how well I’d snugged them on his feet. Uninformed about other types of boots (unwilling to just refund/exchange the damaged boots every few weeks), I stuck with them, adding snaps, sewing repairs and turning them into frankenboots that still… really didn’t stay on adequately. We ended up using hockey tape at the ankle every time we went out skiing. We still played the 1-2-3-4 game, and I carried spare hockey tape in my pocket. Last year, I contacted RuffWear and asked if they’d be interested in a review of their Polar Trex boot. It looked like it already had a lot of the things I’d added to the frankenboots, without any handiwork on my part. I’d read some good reviews of their other projects by You did What with your Weiner, so I had hopes that this product might also be good. They were nice enough to send me a set. It was fate – that (and my own purchase of new Sorels) would explain why Toronto’s winter last year consisted of a low of just about freezing, no snow, no de-icing salts and a whole heck of a lot of rain. This year, however, do I got a tale to tell! We had snow for a little while, we’ve had some bloody cold temperatures, and my neighbours are putting salt down like it holds the key to spring arriving on time. Gwynn and I have finally had a chance to give these boots a thorough workout, and I’m ready to give you all my honest opinion of them. I’ll be posting that this week, so stay tuned! I really, really want to complain about the cold. SO. MUCH. 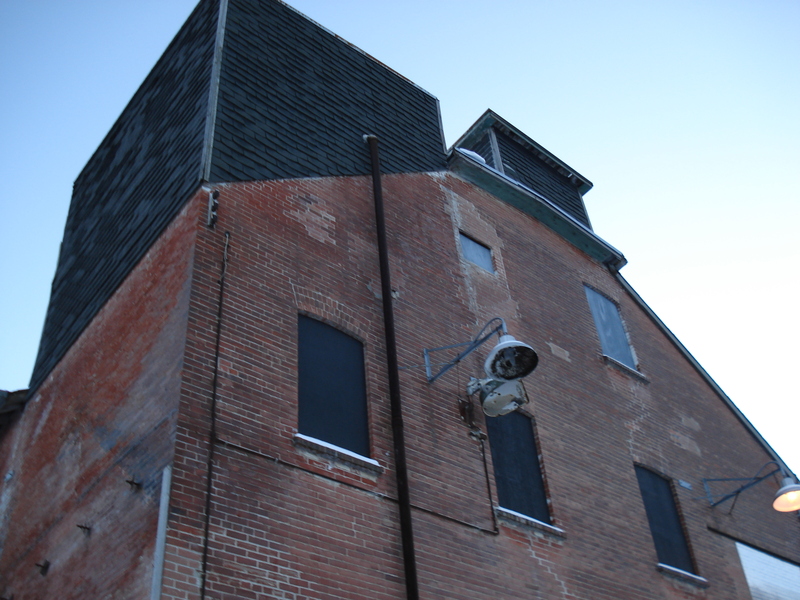 It was -12 Celsius (10 F… according to google) on Saturday, and windy, and holy cow, it was cold! But it’s -27 Celsius (-17 F)(NOT factoring in wind-chill) in Calgary today, so really, I believe the phrase that applies to me is ‘buck up, sissy-girl’. The other reason that it isn’t reasonable for me to complain is this – half-way through January, and this is the first time it got this cold? I am spoiled in winter weather this year, and I should shut up before Murphy catches up with me. 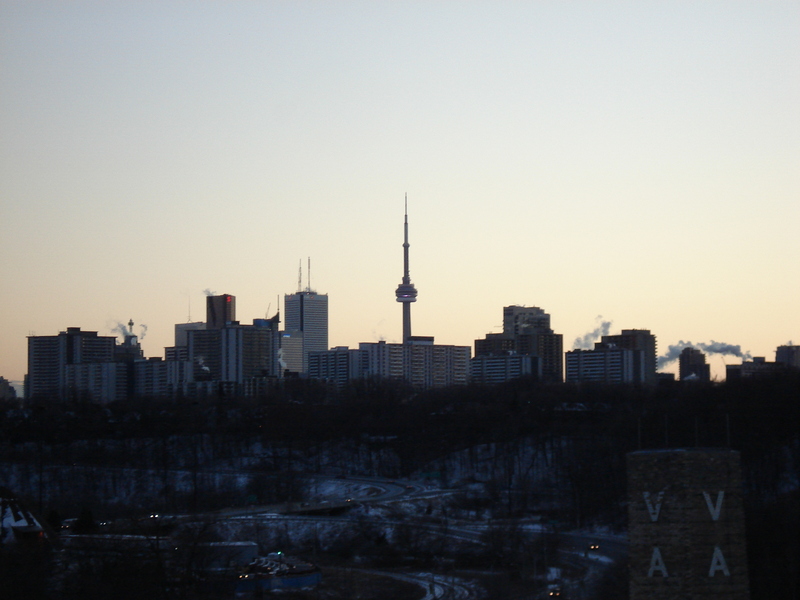 This time last year, I was a month and a half into a royally unpleasant season of icy winds and freezing rain – a world of sloppy slushy, gloomy grey standard Toronto Winter. Last week was the first time they salted the sidewalks (they being ‘everyone other than my one crazy neighbour who just layers down the salt so heavily all winter that I walk on her lawn to avoid the gravel-like dog-foot-doom she creates’). This winter, apparently the road salt industry (in Ontario, at any rate) is having serious issues – they aren’t selling enough salt, and the people being paid to salt the roads – they aren’t getting paid to salt the roads. first snow in the GTA that lasted more than the evening-on-which-it-fell. Prior to this, they were salting the roads 'just because', like that time that they thought it might rain, and then might, after that, get very cold, and create ice... but it didn't. There’s a whole industry that is going into decline. But HOLY COW, it was COLD out! 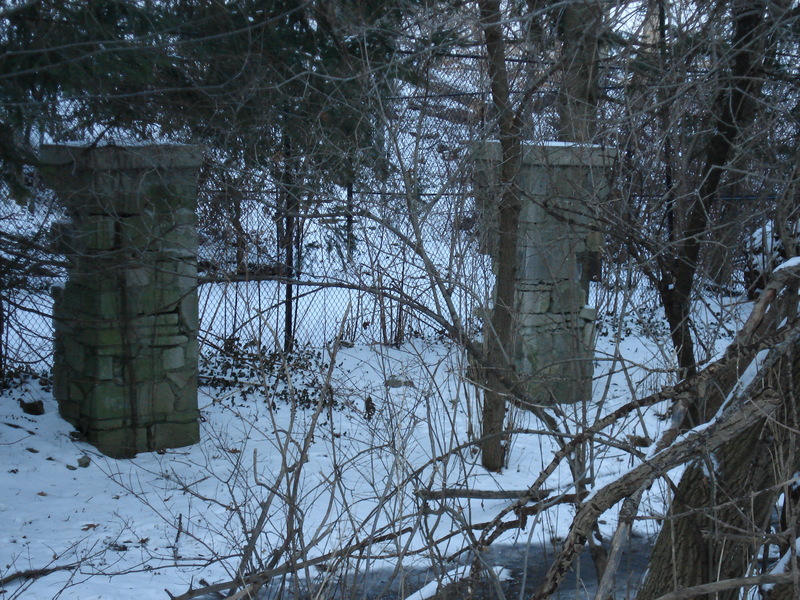 random pillars in the park north of the Brickworks. I didn't take any pictures (not wanting to look overly creepy, or have my fingers fall off from the cold), but there are a LOT of really pretty houses along the ridge overlooking this particular creek valley. Nothing like admiring the backyards of the rich and... well... rich. I think the real problem was that it went from +10 C down to -12 C in the course of hours. Friday evening, it was chilly – like, around freezing ‘chilly’ – Saturday morning, it was bitter. 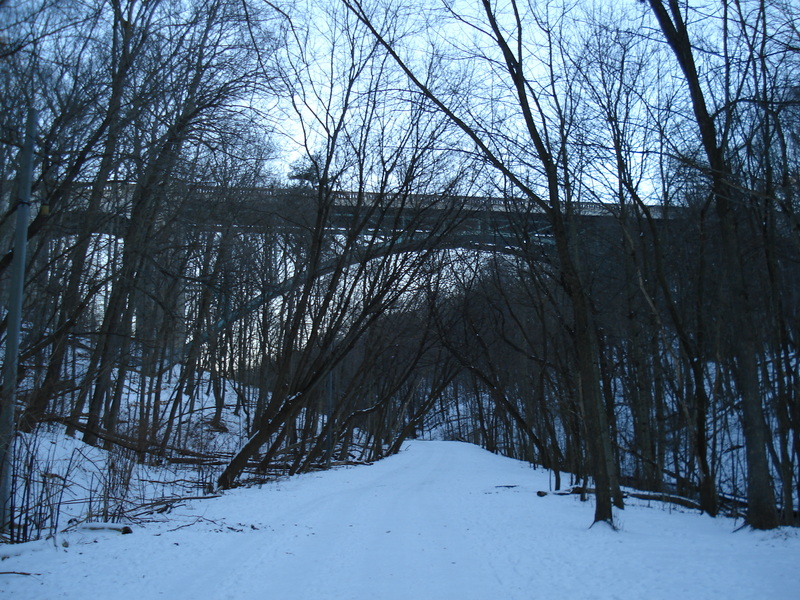 Also, going for a three hour walk that went down through the trails by the brickworks, and then back up Yonge street to St. Clair (where I parked my car)… that might not have been the wisest choice. Not to mention that this walk started at 4pm, with only a brief pause in a doggy boutique (to defrost) on the way back. Plus side – Gwynn loves it. This kind of weather is the reason I am letting his coat grow out until spring. He is completely insulated, and completely ecstatic at any opportunity to roll around in the cold white stuff, even when it’s a windy 12 below, and my face is so cold that my words slur from the numbing effect the wind has on my lips and jaw muscles. He bounced along beside me, beard crispy with icicles, while I wished I hadn’t let my face freeze into a smiling position. My teeth hurt from the cold. The other plus side is that my reason for driving across Toronto to go for a walk was to join a good friend I don’t see nearly often enough for a walk in the woods. 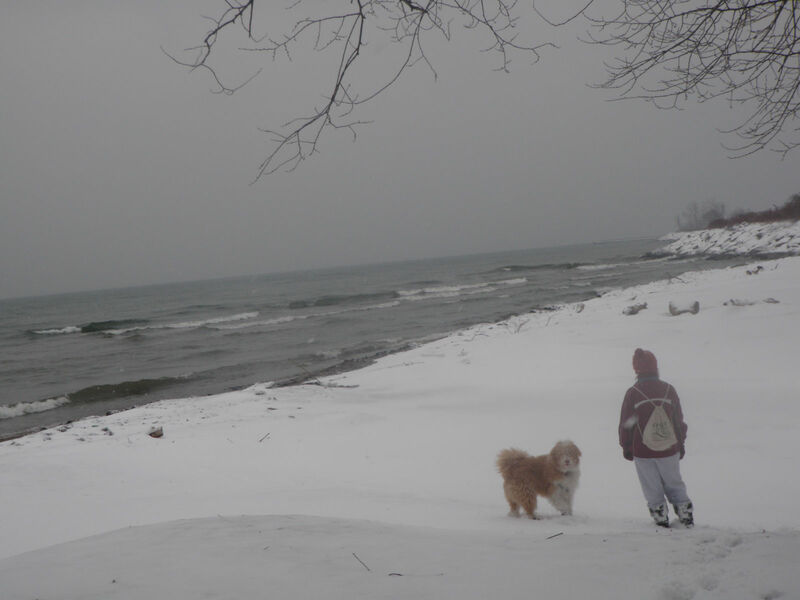 She is my only friend in the GTA whose idea for ‘what should we do?’ would be (in the winter) ‘go for a long walk’, instead of ‘go to a movie/restaurant/bar’, and I am so grateful for that. Much as I like movies/food/alcohol, I really think I spend an unhealthy amount of time watching TV, I prefer cooking and trying new recipes, and I really don’t drink all that much (not to mention the ‘past my bedtime’ factor of going to bars or clubs). I really can’t complain about the weather, especially now that the temperature is back up to +4 Celsius. Though, now that it’s warm out, I want to complain about the fact that all the snow is melting into sodden heaps of mush. Who knew it would be so violent?! A quick hello and goodbye-for-now, since my blogginess has slowed to a snails pace in the past while. Still alive, although it sometimes feels like it is only barely. Maybe scheduling two separate vacation plans within hours of each other, a 6 hour drive apart wasn’t… the wisest choice. BUT it was damn fun while I was in the midst of it. I’ll share some stories once I am back from a weekend of dock-sitting at my cousins’ cottage. I’ll leave it at this: Events transpired. … Did all of you ‘get’ it at first glance? I’ll be honest… I didn’t. 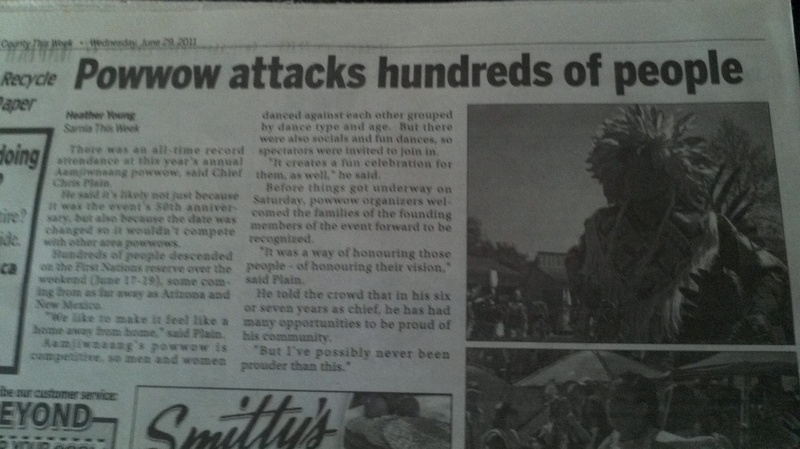 And I was faced with the newspaper itself this past weekend! Happy weekend, all – Hope it’s entertaining and relaxing! pps. I won a contest run by Tena at Success Just Clicks, and my winning tug arrived in the mail while I was gone. You have no idea how exciting that is – firstly, I love signing up for contests… it is VERY rare that anything more than email-spam comes from this (… ever…)… and secondly, I love recieving non-banking-mail, especially packages. LOVE IT. So getting a package in the mail was as fantabulous as christmas in Who-Ville. It’s like I got a slice of rare Who-roast-beast and the last can of Who-hash. She has plans to run more contests for dog swag from her etsy shop, so keep an eye out on her blog. I’ll post pictures of Gwynn’s attempts to take the tug (gloriously orange and yellow and red) from me around the same time as I post about my epic adventures in too-much-driving-land. He loves it. Has loved it since I took it out of the package. ppps. Texas (or anywhere else with ridiculously high temperatures, since I’m guessing Texas is a dry heat, and this was not)- take your weather back! Yesterday’s high of 38 (feels like 48 with the humidity) was NOT appreciated. This is Canada, we like to be able to leave the sauna once we’re warmed up. pppps. so much for ‘quick hello and goodbye-for-now’. I have a feeling that short stories aren’t my forte. Clearly, Mother Nature was pissed off this weekend. The swinging pendulum of weather over the course of two days (three, if you include Friday) was shocking, and difficult to accommodate. Friday fit well enough into late-winter weather – warmer than most of the rest of the winter, still frozen, lots of ice everywhere. No big deal, Tall Sister and I donned our standard winter gear and trekked through the creek valley with Dog and his blonde girlfriend Sadie (the not naming things thing is getting irritating… names will be thrown in will-he-nill-he, just because. ), Dog and Sadie ran laps through the forest around us. My legs even recovered sensation by the time we left for obedience class. The warm-ish winter weather meant, of course, that the school gymnasium in which we had obedience was doing a sauna imitation, because the school doesn’t adjust temperature quickly. Great day to have a doggy-obstacle course set up for fun-time-trials. Saturday, we switched to an entirely different region’s version of winter weather – it was Monsoon season. Dog and I held off on our walk for quite a while, until I was quite sure that, if anything, the rain was getting harder. Half the backyard was underwater by this point. We made a brief foray into the creek valley park, but a big section of the path that passes under a road bridge was entirely submerged, and I wasn’t wearing hip-waders (or stupid enough to try wading the creek with knee high water and a strong current), so we beat a hasty retreat, heading back home. Luckily, Dog seems to dislike rain as much as I do – when we got back from the walk, he sat forlornly on the back door carpet while I tried to dry him off as much as I could. He sat there a bit longer after I gave up, looking pathetic, as though saying, “That’s all you could do to ease my suffering? You love me so little?”… I could actually see him tolerating a raincoat – or some kind of umbrella-harness-system, if it would keep him more dry during rainy-day walks. I went out on Saturday night, getting soaked in the line-up to get into the bar, but, overall, I was happy that I was at least warmer than I would have been had the winter weather still been upon us. Within two hours of us getting to the bar, Mother Nature switched from above-zero-and-raining to zero-and-hailing… and this rapidly changed to zero-and-snowing. Not just a little bit of snow, of course – by the time we left the bar, the snow came up to the top of my feet. My feet, which were stupidly wearing ballet flats. There was more snow on the ground than we got during the so-called snowmageddon that shut down the GTA a few weeks ago. By the time we made it to my neighbourhood by transit, the snow was ankle deep – this after a full day of solid rain. My friend and I must have been a ridiculous sight, trotting down the middle of the street in our inappropriate footwear and bar clothes, each of us in our own tire-track, to keep our feet out of the snow. Sunday was, at least, not rainy, so we were able to go on a nice long walk through the winter wonderland my neighbourhood had transformed into. The people we passed, shovelling their driveways, were not impressed by this weather. Dogs in general were thrilled, Dog in particular acted as though he’d never seen snow before. Dog met up with his red-headed girlfriend, Anya (the Vizsla), for an extended romp in the snow. In case you were wondering, yes, my dog is a player. And also, apparently, irresistible to all Vizslas – it’s like they (male or female… every Vizsla he’s met) see him, and think, “we will make beautiful puppies together – fast and warm”, and then do their best to claim him as their own. This strange attractiveness was extra visible when Anya and a handsome intact (ie, still fully equipped) male Vizsla fought over Dog like he was the last meatball on earth. All in all, we went from having a bit of snow, to no snow, to lots of snow over the course of slightly more than 24 hours. I wish Mother Nature would make up her mind, because a few days of warm weather make the cold even worse. Especially after I got a good sighting of green grass! Anyone else think Mother Nature’s off her rocker? One of the things I worried most about, when getting a dog in the fall was the fact that, in very short order, I would be trudging through slush and sleet and freezing rain. I might live in Canada, but the city I live in doesn’t get much snow. The area I live in, right near a great lake, gets even less snow – warmer in the winter and colder in the summer than the rest of the city due to lake effects. So, in my picturing winter, I had in my mind, memories of last winter – nearly constant wind, icy rain and hail that cut your cheeks, and general misery that sent everyone huddled into their collars, leaning into the wind as they rushed to get inside again. The times I did see people out with their dogs, it was hard to choose which was the more pathetic of the pair – the people bundled up in winter gear, turtling their heads further into the collar of their coats, or the dogs shivering and shifting their feet as the awful freezing rain pelted at their faces and soaked into their fur. I would definitely say ‘the people’ now, since, from what I can tell, my dog really doesn’t care what kind of weather it is, or how cold he’ll get while outside, he still wants to go out. Luckily for me, he isn’t a huge fan of rain (I think it’s because it takes him so long to dry out afterwards), so our walks in my least favourite weather (cold and windy and rainy) are shorter. The brief moments I thought about how snow would make my walk didn’t bring all that much concern – as I said, we don’t get much here. I figured, it’ll be less awful than rain or sleet or extreme cold, but more awful than the usual pre-dawn walk with none of those complaints. Well, this isn’t the first time I’ve woken up to thick fluffy snow in the morning since Dog and I began taking daily morning treks through our neighbourhood together. But this time, I was expecting so much worse. All the previous day, there were severe weather warnings – people in my office making plans to work from home tomorrow to avoid the terrible driving conditions, people predicting over 30 cm of snow by morning. That didn’t sound like a huge amount, to me, but I figured this kind of fuss must be for a purpose. This morning, my clock-radio burst to life at its usual godforsaken hour just in time for me to be plunked down into the middle of the weather report – high winds, hail, lightning and thunder… I leapt into action to switch off the radio – no need to hear how awful it is outside, it might shake my determination to go out there – as I rummaged on the floor for the sweatpants I had on yesterday, and groped across the bed for the wool sweater I knew was there somewhere. At the moment, my room is rather like a minefield, so I minced and stumbled my way out of my room in the dark, and, without my glasses, glanced up at the skylight – can’t see anything through there, wow it must be awful. Glanced out the bathroom window – grey and opaque, can’t see anything out, wow it must be awful. Finished the necessary ablutions before heading downstairs to free Dog from his crate (and the Cone of Shame… poor guy is out of the ball-game now), finally take a moment to look out the back door with glasses on – not so bad… not even snowing. There’s snow on the ground for sure, but where is the Snowmageddon? snowpocalypse? snowmygod?… snowlycow? snowgasbord? Not even a snowgasbord? I’ll admit it, that one was not very good or creative… and not very clear either… smorgasbord (Scandinavian meal served buffet-style with multiple dishes of various foods on a table, so says Wikipedia). The news outlets and weather network couldn’t possibly be so mistaken, I think, pulling on snowpants (over my sweatpants, which are over my pj pants), and failing to find a balaclava. I pull on a neck-tube, wrap a heavy scarf around that for additional protection, and put on a hat and a headband. The schoolboards in the entire area are closed, and my father, the man who has had fewer sick days in his entire working career than I had in one year of elementary school, is staying home. I wrestle the booties onto the long-suffering Dog, and stuff my own feet into my heavy duty winter boots. It must be extremely cold out there to warrant the snowmageddon predictions – the road in to work will be so terrible, but that probably won’t be a problem, since it is doubtful that I will survive the gale-force winds that must be blowing just outside my door. Hopefully I tightened the dog booties enough – once out of my yard, I bet there are white-out conditions that will prevent me from even being able to see the ground, let alone find a lost bootie! I will be strong, though, and fight through this – the dog must be walked. Silly me, I forgot to multiply Snowpocalypse by the over-reaction coefficient (.5), and the GTA-crazy coefficient (.1)… the snowpocalypse is more like an extrava-snow-za – just enough snow to make walking a bit tougher, not enough that you need to shovel the driveway before leaving for work. By the time I reach the end of our street, I am roasting from my over-dressed-ness. Dog is bounding around like a jackrabbit, shoving his head into every snow bank we pass until his beard is white and snowy as Santa Clause’s, crispy as Jack Frost’s. One street is ploughed, but the salting trucks haven’t been out yet – clearly Dog didn’t need the boots to protect his feet from salt – there isn’t any. And the cold? Not that cold! Especially for a dog wearing a half-foot of fur. ng around you in a full-out snow-frolic of joy. He looks like Snoopy doing the happy-dance. Most winters, by the time February rolls around, all I want is the quickest route to spring, but there is no better way to remember the upside of winter than walking through a winter wonderland. © lexy3587 and Gone for a Walk, 2017. Unauthorized use and/or duplication of this material without express and written permission from this blog’s author and/or owner is strictly prohibited. Excerpts and links may be used, provided that full and clear credit is given to Lexy3587 and Gone for a Walk with appropriate and specific direction to the original content. Translation – borrow, but give me a bit of credit, and don’t try to claim it as your own. 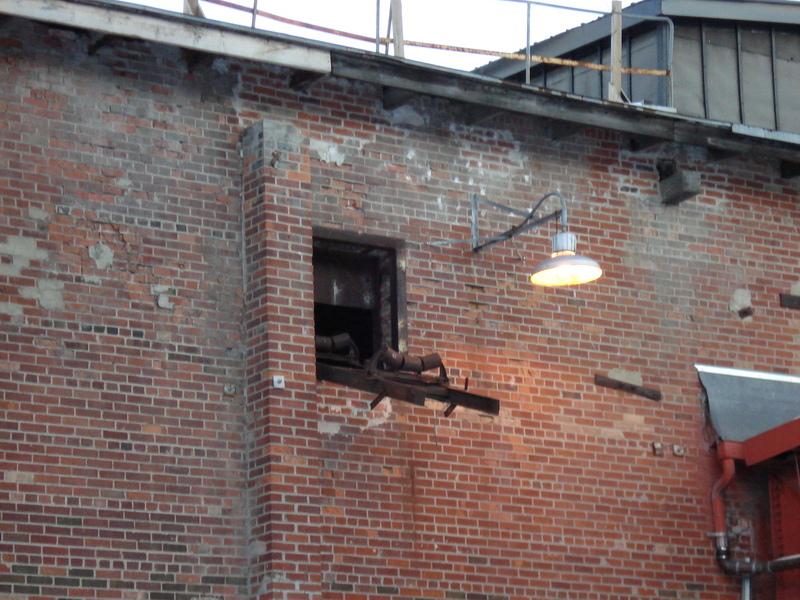 Also, if you’re wondering where I got the pictures I use on my blog, click on them – if it just opens to itself, it’s mine. If it comes from somewhere else, it will take you to that site. If you take a picture from my blog, please link back to its original owner, not just my site.